There must be hundreds of stories on the Royal wedding. There's one titled "Don't Ruin Her Buzz" and it says that Meghan Markle was smacked in the face by a huge fly during the Royal Wedding. One can look at the video HERE. It certainly looks like a huge fly bumps into her face. What are all the Royal Couple stories? How can there be so many? The world of exposes and tabloid news has matured and the topics seem endless: Her half-brother and half-sister - who they are that they weren't invited to the wedding is one. All the things that Meghan can't do now that she's part of Royalty. Blow-by-blow coverage of the wedding 'moments', especially stories of what might be 'breaking protocol'. All the celebrities that attended, and who said what about whom. In contrast, Google Trend results show the top questions were fact-based: when is the Royal Wedding, What time does it start, etc. And then the queries were about 'Stand by Me', the cellist playing at the Royal Wedding, and the sermon. The analysis says that since their engagement was announced, Meghan and Harry have become some of the most searched Royals on Google. See all the Royals trends HERE. 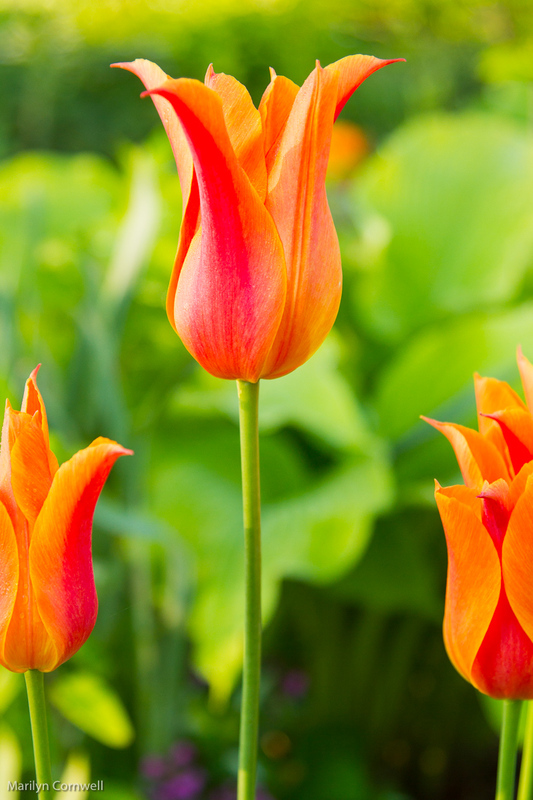 Today we look at the late flowering tulips - these are known as Lily-flowered. The benefit of the late varieties is that they withstand the heat well, so often last into June.